HMB SOMA Valentine’s HeART Walk - Sun., Feb. 12 from 2-5 p.m.
South Main Street in Half Moon Bay is often missed by tourists who don’t walk the entire length of the downtown area. This area of Main Street is now home to almost a dozen flourishing art businesses. They are known collectively as HMB SOMA Arts. The group’s first event in December drew a large number of visitors from near and far. HMB SOMA Arts supports and promotes both visual and performance artists on the SOuth end of MAin Street in Half Moon Bay. The First Annual Valentine’s HeART Walk on will be held Sunday, February 12 from 2 - 5 p.m. Refreshments, raffles and music will be offered at most venues. Visitors are invited to take a romantic stroll along South Main Street and discover a wealth of art treasures. 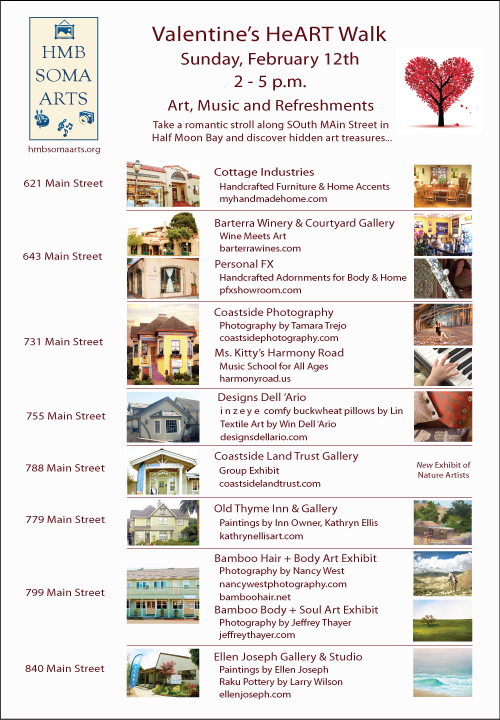 HMB SOMA Arts has expanded to include businesses in the 600 - 800 block of Main Street in Half Moon Bay. New members include Cottage Industries, Barterra Winery and Courtyard Gallery, Personal FX and Designs Dell ‘Ario. Visit the HMB SOMA ARTS website: http://hmbsomaarts.org to learn about all the Specials offered during the Valentine’s HeART Walk.